In this post, we cover how to use Golang and HTTP requests to the HERE API to integrate an interactive map into an application. We're going to request a map image that contains a polygon. We'll be able to specify the sizing information for this image as well. Before we jump into the Go code, we should probably understand a little more about the HERE Map Image API. Since this is a REST API, there will be different endpoints for accomplishing different things. A list of those possible endpoints can be found here. For this example, we'll be focusing on the region endpoint. Generating an app id and app code is free and can be done in the HERE Developer Portal. After executing the command, you'll notice that it created exactly what we saw in the prior image at the top of this tutorial. The request made use of a few parameters. The a0 parameter represents the area to draw the polygon. It represents each of the points in the shape. The w parameter represents the output image width, along with h being for height. The ppi represents the resolution and z represents the zoom on the map. The a0 is probably the most complicated part of this request. So now we should probably make something useful out of this API. We won't be doing anything fancy in our Golang application. We'll just be constructing a request and sending it. Most of the setup will be around the data model for our polygon, to make things a little easier on the developer. Great, so we have the points for our polygon. The problem is that our a0 parameter still expects a string. We can create some classic toString functions to take care of this. In the above function, we are looping through each of our points, converting them into strings, and then joining the slice of strings into one string delimited by a comma. While long, the above function is just creating a URL string with query parameters. Each of the query parameters is what we've already seen in the raw request. For more information on consuming data from web services with Go, check out a tutorial I wrote titled, Consume RESTful API Endpoints within a Golang Application. After executing the request, if it didn't fail, an output file is created and the response body is saved directly to the file. The response body should be image data. 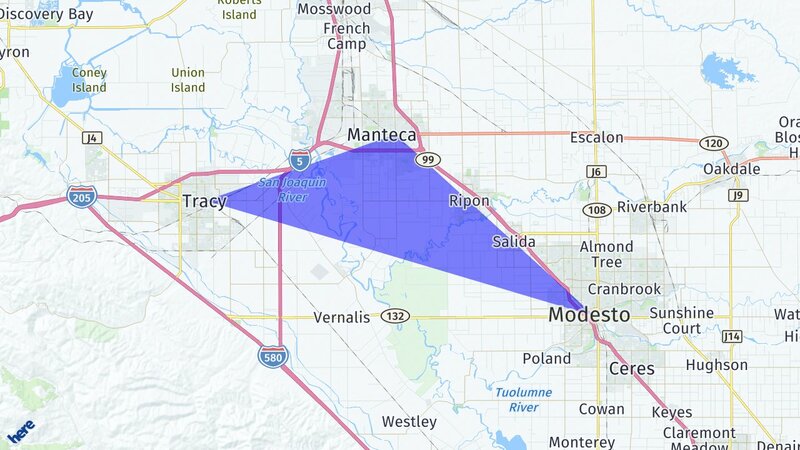 The above main function makes use of the new GetMapWithPolygon polygon function. You just saw how to use the HERE Map Image API with the Go programming language. This example was probably a bit overkill because it is only a single request to a REST API, but it is a common question that I receive at events. Knowing how to generate map images as needed can be a useful ability.